Currently models for Open Rails are created in the same way as for Microsoft Train Simulator. This process is quite involved and the Open Rails team will be developing tools and formats to streamline it. There are several products which support modelling in 3D and produce the formats used by Open Rails and Microsoft Train Simulator. scottb613 has posted a tutorial for building locos using 3DCrafter as a series of forum posts. YouTube hosts many tutorials for SketchUp. Google provides a tutorial especially for 3D buildings. There is a list of tutorials for GMax on Elvas Tower. The key advantage that Open Rails currently offers over Microsoft Train Simulator is that good frame rates can be maintained with a much higher number of polygons, so curves can be smoother and more detail can be modelled. Open Rails also displays 32-bit color (whereas Microsoft Train Simulator is limited to 16-bit). Another advantage is the longer viewing distances, adjustable from 2km out to 10km. There will be other advantages as we move beyond our current status of Microsoft Train Simulator-compatible. One of these advantages is 3D cabs. 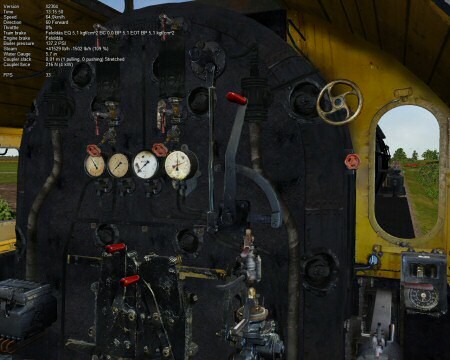 Open Rails now supports 3D cabs interiors as well as the Microsoft Train Simulator 2D interiors. Models of rolling stock and signals can take advantage of a few features which are only available in Open Rails. The manual contains a list of about 40 parameters which improve the operation of locos. There is also a Train Control System (TCS) under development which reports the state of the train to the driver. This allows any continuous monitoring system such as the German LZB and the European ERTMS to be modelled. The modelling is carried out by programming in C#.